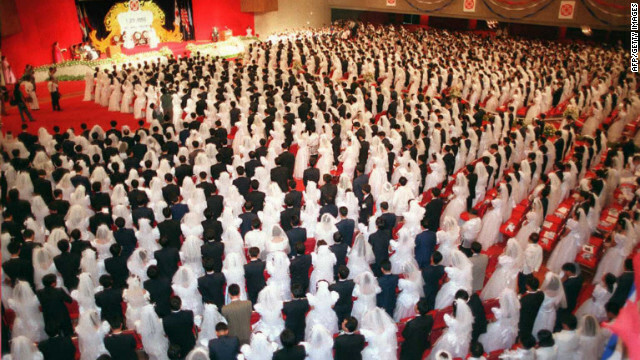 More than 1,000 couples participate in a Unification Church mass wedding in the Philippines in 1996. Editor’s note: Eileen Barker is professor emeritus of sociology of religion at the London School of Economics. With the death of the Rev. Sun Myung Moon at 92, we see the end of an era. Moon was the last surviving charismatic leader of the wave of movements that spread throughout California and the rest of the West in the 1970s and ’80s - other examples included L. Ron Hubbard’s Scientology, David Berg’s Children of God and Prabhupada’s Hare Krishna movement. In the case of Moon’s Unification Church, hordes of young, well-educated hippies left college and their comfortable middle-class homes to work up to 18 hours a day on the streets, selling flowers or candy and urging others to follow a Korean who declared that he was the messiah. After they had spent perhaps years in mobile fund-raising teams and had drawn a sufficient number of “spiritual children” into the fold, these young converts would be "matched" with a partner whom they were unlikely to know (and who might not even speak their language) and then blessed in a mass wedding ceremony with thousands of other couples. Perhaps it was not surprising that many of their parents, who had other plans for their (adult) children’s futures, objected strongly when their sons or daughters started referring to Moon and his wife, Hak Ja Han, as their “True Parents,” in some cases cutting themselves off from their families. A number of so-called “anti-cult movements” sprang up throughout the United States with the aim of exposing and combating the perceived evils of such “cults.” Large sections of the media joined in the fight, agreeing with the anti-cultists that the only possible explanation for the young people’s behavior was that they had been brainwashed. This theory led to the arrival of “deprogrammers,” who would kidnap converts, holding them against their will until they either renounced their faith or managed to escape back to their movement. In the meantime, Moon’s notoriety in North America was spreading far beyond the concerns of individual families. He and his church were investigated for connections with the South Korean CIA by the U.S. House of Representatives Subcommittee on International Organizations. At the time of the Watergate affair, Moon came out strongly in support of President Richard Nixon. And in 1984 he was sentenced to prison for tax fraud. Moon also accumulated impressive wealth through his teams of volunteer members and through a number of businesses in both America and elsewhere, particularly in Japan and South Korea. His businesses included armament factories, boat building and fishing, ginseng products and a number of media outlets, including The Washington Times. Although Moon is likely to be remembered for all these things - mass weddings, accusations of brainwashing, political intrigue and enormous wealth - he should also be remembered as creating what was arguably one of the most comprehensive and innovative theologies embraced by a new religion of the period. The basic beliefs are to be found in the “Divine Principle,” which describes how the Fall took place when, in the Garden of Eden, the Archangel Lucifer - who had been asked to look after Adam and Eve until they were mature enough to marry - had seduced Eve into a spiritual, sexual relationship. According to Moon, Eve later had a sexual relationship with Adam. As a result of this Lucifer-centered (rather than God-centered) union, their children were tainted with “Fallen Nature,” the Unification equivalent of original sin. According to the “Divine Principle,” the whole of history is interpreted as God’s attempt to restore the Kingdom of Heaven on Earth. Jesus was meant to get married but was killed before that was possible. Moon, with his marriage to his second (or third) wife in 1960, is said to have laid the necessary foundation for restoring the Kingdom of Heaven on Earth, with the mass blessings playing a role in purifying the blood lineage of the participants. Moon’s movement has undergone considerable changes since its founding in 1954. Most members no longer live in communities but live and work independently, possibly tithing 10% of their income to the movement. There is now a burgeoning second generation which, to a large extent, is involved in running the movement. Moon’s children have taken up leadership positions, with the youngest son, Hyung Jin Nim, being the heir apparent. But a split has emerged within the “True Family,” with siblings fighting among themselves for the assets and control of the movement. It is unlikely that Unificationism will continue as a single entity. But also unlikely that Moon’s legacy will fade away within the foreseeable future. The opinions expressed in this commentary are solely those of Eileen Barker. I pray to a god I don't even believe in that you will shut the f v ck up.